Willem Jonker, CEO of EIT Digital, yesterday (13th) announced the details of the organisation’s strategic innovation agenda 2017-2019. This will drive digital innovation and entrepreneurial talent needed to secure/ catalyse Europe’s digital transformation. As set out in its Strategic Innovation Agenda, EIT Digital will focus on the core areas that present opportunities for Europe to lead internationally and address pressing social and economic issues. The Strategic Innovation Agenda 2017-19 consists of two main pillars of activities: generating significant innovations from top European research results through incubation, acceleration, entrepreneurship, market uptake and rapid growth of these innovations and developing European human capital by sourcing and training entrepreneurial digital talents. Since the launch of its operations in 2010, EIT Digital innovation and education activities have successfully driven Europe’s Digital transformation creating a total of nine new companies and launching 50 products commercially in 2016. Over 200 startups have been coached by the EIT Digital Accelerator and more than €77 million in capital has been raised for EIT Digital startups. EIT Digital has a network of 130 educational and industrial partners with EIT Digital, 19 of 20 added in 2016 were industrial partners. In Entrepreneurial Education, 1500 students have studied in one of the eight Master programmes, 160 have enrolled in the Doctoral School in seven countries. Over 20 courses were launched for professional students to enhance their digital competencies, and at the same time, their job market value. 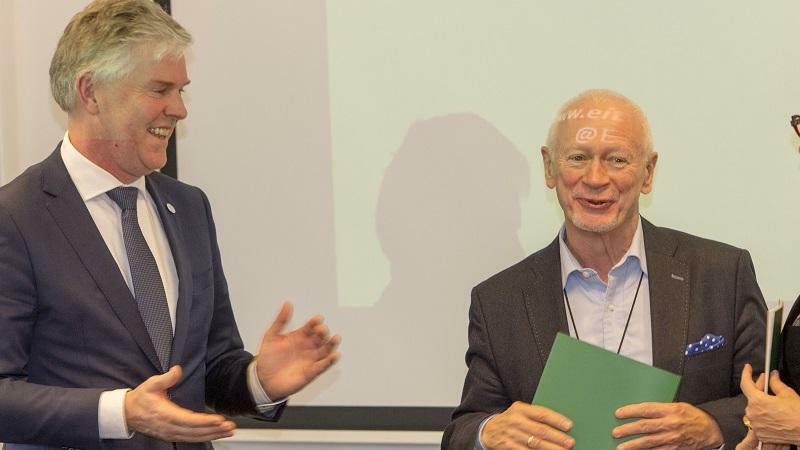 Twenty top European universities partner with EIT Digital to provide EIT-labelled programmes. Over 20,000 students have taken EIT Digital’s 25 Massive Open Online Courses (MOOC). “These figures are impressive and without them Europe’s digital industry would not be as strong as it is today. The years to date were time for EIT Digital to establish operations and infrastructure. I would like to thank all our partners, students and employees for making this happen. Now we have a solid ground for executing our next three years’ Strategic Innovation Agenda and raise our operations into a totally new level as can be seen in our ambitious targets set for 2017-2019”, Mr. Jonker said. Digital Infrastructure: Addressing the core enabler of the digital transformation by providing secure, robust, responsive and intelligent communications and computation facilities. Each innovation area comprises a portfolio of open innovation activities carried out by EIT Digital partners as well as fast-growing technology startups that are ready to scale commercially. These entrepreneurial projects are grounded in game-changing research , high-profile technologies and disruptive business strategies. Street Smart Retail (executed in Trento, Helsinki and Berlin) is developing a suite of modules for retailers, leveraging omni-channel data, to provide customers with a seamless shopping experience in-store and on-line, will focus on the integration and consolidation of the Digital Retail Suite core platform (owned by Reply) and on business development. Telecom Italia and British Telecom will oversee go-to-market for the vertical applications (for permanent and temporary shops respectively) built on top of the DRS core platform. The core technology will also be transferred to a spinoff (co-founded by EIT Digital) that will lead the global rollout, targeting small/medium retailers worldwide. The solution will increase small/medium retailers’ competitiveness on multiple channels against global on-line players. Operating Digital Industry with Product and Services (executed in Munich, Paris and Milan) is a new three-year activity that will start in 2017 and will focus on the creation of Digital Innovation Hubs to support and enable the digital transformation of European Industries. A common platform based on Siemens MindSphere and FIWARE Generic Enablers will be developed by Siemens, Engineering, ATOS and CEA. An ecosystem of Digital Innovation Hubs (at EIT Digital’s CLC locations) will integrate big European Industrial players and SMEs aiming at supporting and facilitating the development of new and powerful Digital Industry applications. In 2017 the first applications (production quality monitoring and predictive maintenance) will be developed by FCA, Cefriel, Océ and DFKI. Fit to Perform (executed in Eindhoven and London) is developing the tachograph of tomorrow bringing vital body signs of truck drivers into fleet management systems, alongside vehicle operation and operating environment data. The three-year activity concluded at the end of 2016 and a new startup (co-founded by EIT Digital) will bring results to market during the course of 2017. Astrata, a leading fleet management systems provider, involved in the design, testing and validation of the solution since 2015, will be the first customer. The expected outcomes of the activity will be increased road safety for society, improved quality of life for drivers and improved profit margins for the transportation sector. European Trusted Cloud Ecosystem (executed in Helsinki, Trento and London), entering in its third year in 2017, will focus on the integration of the core technology providers (British Telecom, F-Secure, Telecom Italia, Reply and CNR) to build multi-cloud (including third party cloud) extension services for data security, host protection, data protection and identity management. A few European SMEs providing trusted services will be integrated in the ecosystem (16 SMEs have been already integrated in the first two years of activity). The go-to-market approach will focus on the creation of an Ecosystem Marketplace to accelerate the adoption of trusted cloud applications and services by European consumers and businesses. A significant effort will be also put on awareness creation around trusted services in Europe to facilitate market adoption. Advanced Connectivity Platform for Vertical Segments (executed in Helsinki, Stockholm and Milan), entering its second year of operation in 2017, will continue the development of a platform based on common connectivity (Ericsson) and middleware (Engineering) for IoT application developers. During the first year the platform has been successfully validated with vertical applications in the health (Bittium and Engineering), smart building (Ericsson) and transport (Politecnico di Milano and Engineering) sectors. A first customer was involved ,through Politecnico di Milano, in the development and bought the first version of an IoT avionic prototype. In 2017, new vertical applications in the health (Bittium) and heavy industry (Ericsson) sectors will further prove and validate the platform. The platform will be launched to market by Ericsson and will facilitate the market take up of IoT applications as developers will be able to focus on the applications instead of redoing the whole stack for every use case. Acceleration is a key aspect of EIT Digital’s innovation strategy, and the organisation focuses on scaleups—startups after the product/market fit stage that are ready to scale commercially in Europe and beyond. The main value proposition of the EIT Digital Accelerator is Access-to-Market and Access-to-Finance, which translates into fast-growing average revenues and average funds realised by the supported startups. This positioning is within EIT Digital’s pan-European mission and complementary to national incubators. An example of a scaleup in the EIT Digital Accelerator portfolio is Distribusion (Germany). The company has developed a global distribution system (GDS) for booking intercity and shuttle bus rides and connects bus operators and travel resellers worldwide. Distribusion raised €6m in March 2016 with the help of EIT Digital and announced collaboration with EIT Digital industrial partner Amadeus in July. EIT Digital has also supported the company with introductions to customers, primarily in Bulgaria, Croatia, France, Italy and the UK. EIT Digital has set ambitious annual innovation and entrepreneurship targets for the 2017-2019 period. In 2017, new products target is set to go up by 65% (84) and startups created target is set to increase by 44% (13), 60 new scaleups are expected to join the EIT Digitial Accelerator in 2017, with on average, revenues of €3.5 million, 24 employees, and valuations of €16.5 million. EIT Digital focuses on Human Capital Development and continues to build the brand of EIT-labelled education by training innovation and entrepreneurial talent in its three schools as well as its online programmes.